Congratulations to the students of the Logistics and Production Management Department! The Republican Scientific Conference of Undergraduates and Master’s Students ‘New Mathematical Methods and Computer Technologies in Design, Manufacturing and Scientific Research’ was held at Francisk Skoryna Gomel State University on March 19-21, 2018. Natalia Aleksandrovna Yazubets received the best paper award at the workshop in her subject area. The Republican Logistics Olympiad for Students and Master’s Students ‘Logistics and Supply Chain Management in the Global Economy’ was held at the Belarus State Economic University from March 26 to April 10, 2018. 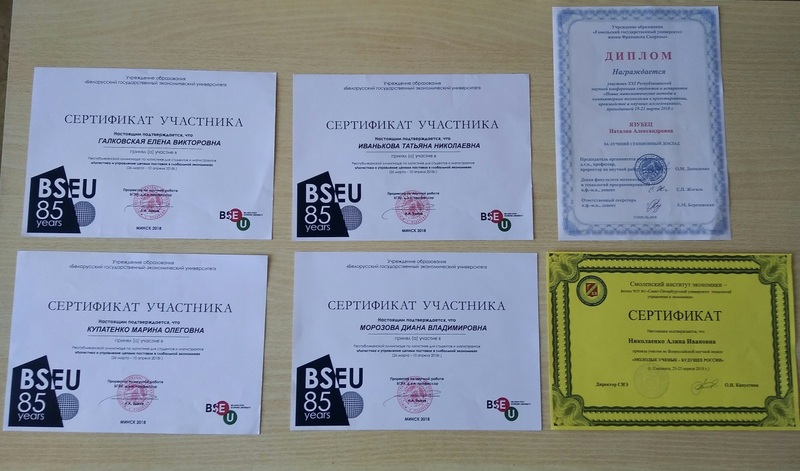 Certificates of Participation were given to Elena Viktorovna Galkovskaya (TL-152 group), Tatyana Nikolaevna Ivankova (TL-152 group), Marina Olegovna Kupatenko (TL-152 group), Diana Vladimirovna Morozova (TL-152 group). All-Russian Week of Science ‘Young Scientists: the Future of Russia’ was held at the Smolensk Institute of Economics on April 23-25, 2018. A Certificate of Participation was given to Alina Ivanovna Nikolayenko (TL-152 group). We congratulate our winners and all those who took part in these events and wish them every success in their studies and the very best in their research endeavours!